Lush really comes into its own around this time of year! I love it when they do themed products and for Halloween this year they have created a really nice collection. 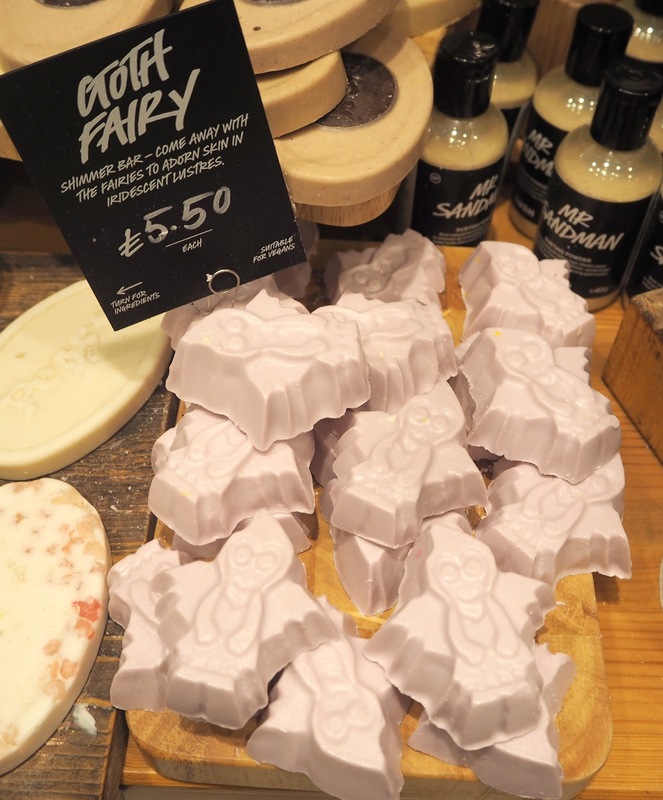 As you may have seen last week I posted about my evening at the Blogger Event at Lush in Crawley where we got he chance to preview all of the new launches for both Halloween & Christmas (Christmas post to come)! I will add my Vlog of the Event to the bottom of this post for you to watch. 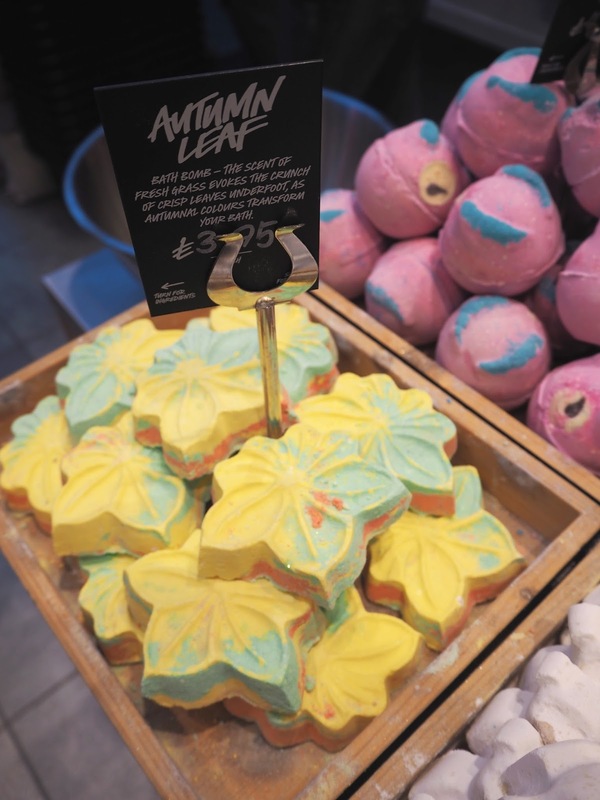 It was such a fabulous opportunity for a self confessed Lush Geek like myself and I ended up picking up one of each of the Halloween products whilst I was there so I can show you...it was all purely for your sakes of course! All of these products with the exception of the Lord of Misrule Bath Bomb & Autumn Leaf Bath Bomb will start to disappear from stores once Halloween is over until stocks run out. So hurry and pick some up if you like the sound of any of these! The other two Bath Bombs will remain throughout the Christmas period I've been told. Pumpkin Bath Bomb | WOW, I love this one! To me it smells like one of those orange studded with cloves that you get at Christmas time, but fizzy. It's so delicious and I really want to stock up on a couple before they go. If you were hoping it would smell like Pumpkin Pie however you might be a little disappointed as there definitely is a strong note of orange in there! 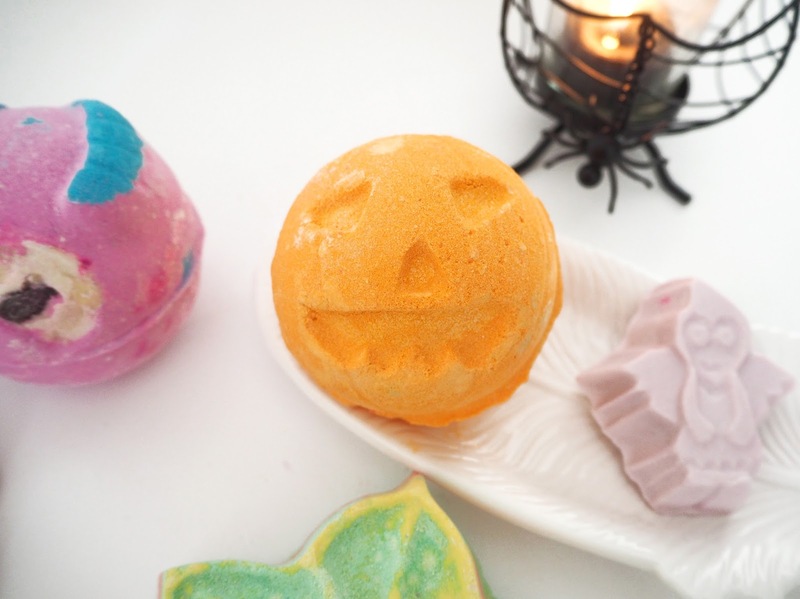 I love the cute little carved Pumpkin face and it turns your bath water bright orange. 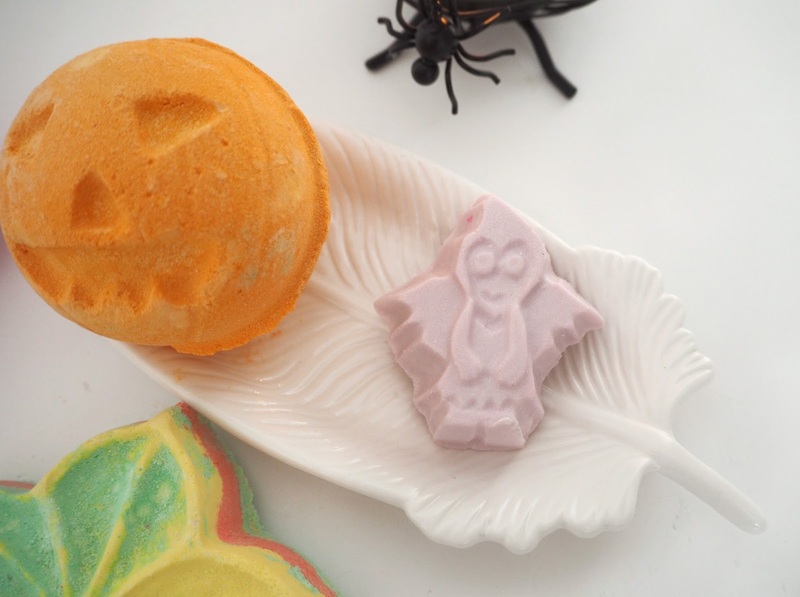 "Serve yourself up a slab of sweet pumpkin pie, dripping in spice and sauciness - it's even more satisfying in bath bomb form. Sweet, comforting vanilla absolute and spicy cinnamon evoke the rich, biscuity fragrance of home-baking and stacked desserts, ensuring that you feel toasty from top to toe. 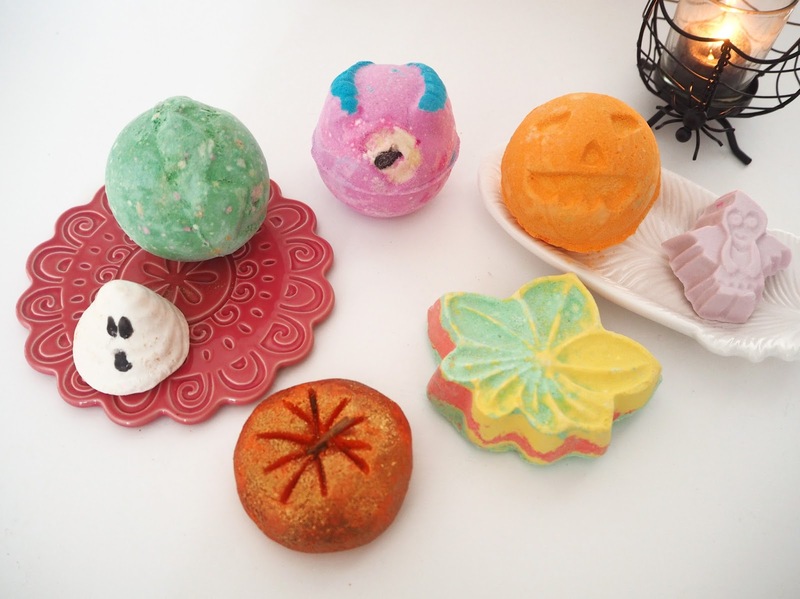 A soak with this pumpkin-shaped bomb is more satisfying than a belly full of pudding." Monsters Ball Bath Bomb | This little guy looks like he's stepped straight out of Monsters Inc! A completely different scent to the Pumpkin Bath Bomb it has Neroli & Lime in there and to me it smells like Parma Violet sweets when dissolving and turns the water denim blue. The eye is last thing to dissolve which was slightly disconcerting! Definitely a spooky little touch. "Eye spy with this little eye something beginning with BOO! This monster mash-up of lime and neroli oils is a sure fire way to get the party started, and leave you feelin’ Franken-fine all night long." 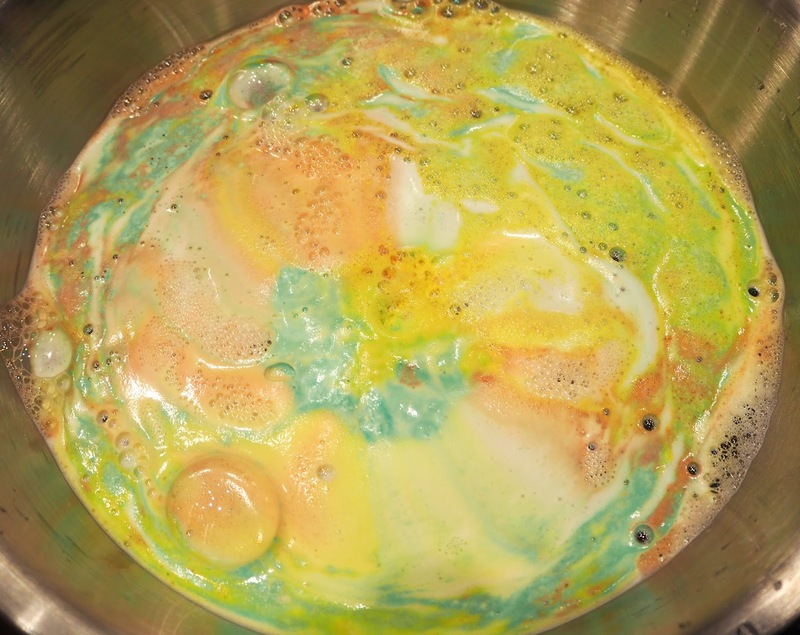 Lord of Misrule Bath Bomb | This majestic Bath Bomb is much loved among the Lush community for its unique fragrances and amazing colours! Plus the fact it's only released seasonally means there is much anticipation for it, similar to Snow Fairy at Christmas. From the outside you don't expect it to be as amazing as it is but once this little beauty gets fizzing it releases a vibrant pink swirl amongst the bright green in the bath. It's very impressive! I will be stocking up for sure. There is also a Lord of Misrule Shower Gel available with the same fragrance. 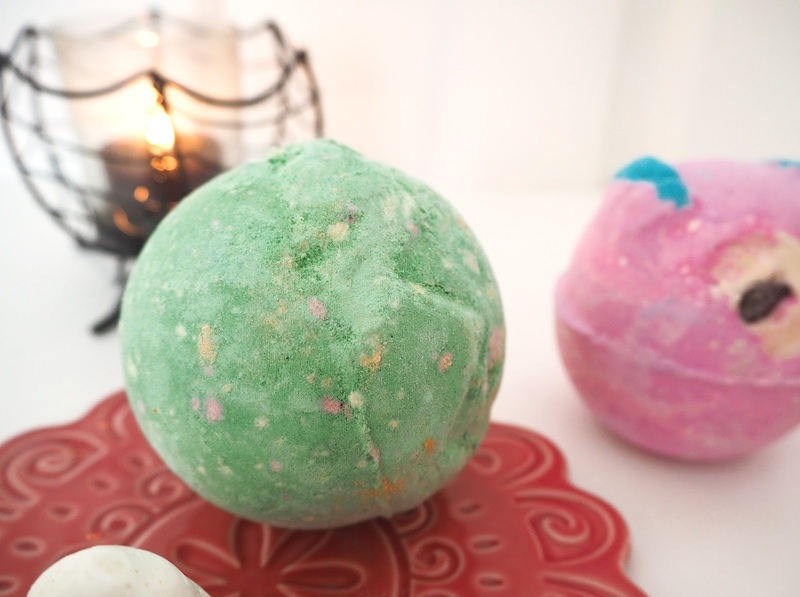 "Revel in your bath with this mischievous bomb that features a spicy herbal blend of patchouli and black pepper oil. Inspired by the ruler of the pagan Feast of Fools, Lord Of Misrule has a deep green exterior that slowly froths away to reveal a rich, wine-coloured centre. 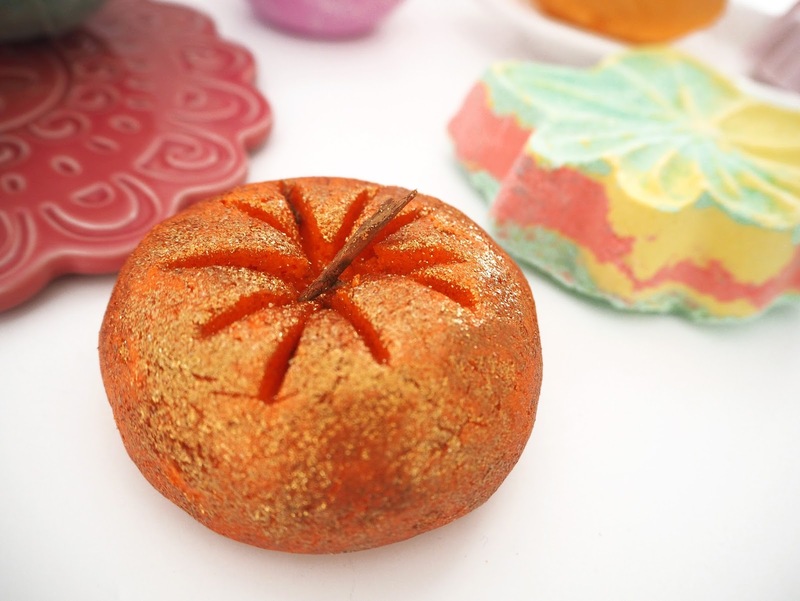 Just like at the Feast of Fools, when the wine starts to flow, the popping candy crackles and the festivities begin..."
Autumn Leaf Bath Bomb | This creates some absolutely stunning bath art! They demoed this for us at the Blogger Event (pictured below) and it has all the beautiful orange, yellow & green shades of autumn swirling out of it. To me it smells like a fresh woodland walk with fallen leaves crunching under your feet turning the water a burnt orange shade. If you prefer sweet scents though this may not be for you but I really like to chop and change my fragrances and I found this a really refreshing uplifting one! "Autumn colours dapple your bath red and yellow, as falling leaves signify the start of winter. From the comfort of a hot bath, watch as the evenings draw in, and the trees don vibrant plumage. The scent of fresh grass evokes the crunch of crisp leaves underfoot as the last remnants of summer are stolen away." 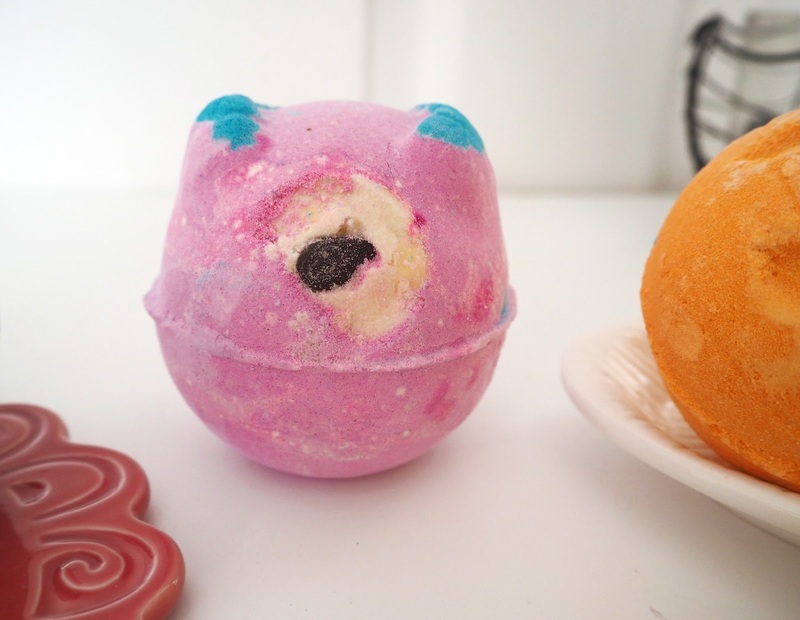 Sparkly Pumpkin Bubble Bar | I do love Lush Bubble Bars, they're very satisfying to use. This one is a little trip to crumble so TOP TIP: break your bubble bars up and put it in a sieve under the tap. This creates more bubbles and doesn't leave crumbled bits at the bottom of the bath! I feel I'm a bit like that fish in Finding Nemo when it comes to bubble baths, I just want all the bubbles! "Bubbles, bubbles, bubbles!" This bar smells delightfully fruity with Grapefruit, Lime & Juniper Oils and leaves lovely sparkling orange water. "I guess you think you know this story. You don't. The real one's much more foamy. Mind you, Dahl got the first bit right, The bit where, in the dead of night, The Ugly Sisters, jewels and all, Departed for the Palace Ball, While darling little Cinderella Was locked up in a slimy cellar, She bellowed 'Help!' and 'Let me out! The Magic Fairy heard her shout. She answered "Cindy, keep your cool! And I shall send you to ball!" Cindy said, "Don't make me laugh, I'd much prefer a steamy bath. My sisters treat me like a pauper, Then don't save me any water!" Moved by Cinderella's troubles, The Fairy conjured up some bubbles, She filled the bathtub to the top And Cindy soon forgot her strop. "Wow," she shouted, "Gold and lime!" A bath this good is worth my time, And readers, it is worth yours too, As (nearly) every word is true." 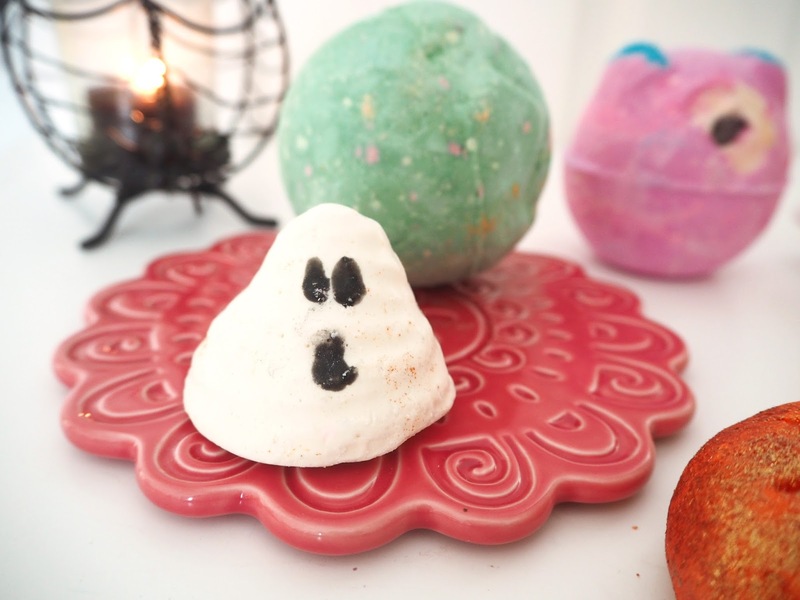 Boo Bath Melt | How cute is this little Boo?! I love it when Lush do little characters and this one reminds me of the little ghost emoji. He smells strongly of ginger so very seasonal but also contains geranium and mimosa oils. The bath melts are ideal for those with dry skin as they are super softening and moisturising leaving your skin feeling amazing. Saying that he is more expensive at £3.50 than the usual Lush Bath Melts and he is very small, but I fell in love with him! "Leave your unfinished business at the door as calming mimosa and earthy, warming ginger coax you into the bubbly water. Your bath is this meringue-shaped ghost's favourite haunt; just pop under the running water to ensure your ghostess offers the mostess. Fair Trade, organic cocoa butter may melt away but the effects are clear: skin feels softer and grounding sandalwood combines with vivid Sicilian mandarin oil to make you feel spooktacular. Boo might look adorable, but it takes relaxing the spirits dead seriously." Goth Fairy Shimmer Bar | Another little Halloween character! I got very excited about this lilac Shimmer Bar. It's very moisturising like their massage bars but leaves a beautiful shimmer on the skin. You don't need to use very much as you do get a lot of glitter from it and just a warning it does transfer a bit! But I think it's perfect for the party season, I think I'll be using it lots as I love my sparkle. You can really smell the sweet grapefruit in there too. Yes it's small but you only need to use it sparingly so I reckon this is going to last me ages! "A multitude of iridescent lustres - gold, green, purple and silver - are packed tightly into this bar to adorn skin in shimmer from the first stroke. As illipe and cupuaçu butters gently melt over the body, they soften skin and leave the ecstatically fruity scent of almond, grapefruit and bergamot. Pick it up before a big night out and dance on into the small hours. The ethereal glow of your body might look too magical to be of this world... and perhaps it is." There are also two special Soaps that have been released called Fireside & Magic Wand and some gift sets to choose from (one, two and three). 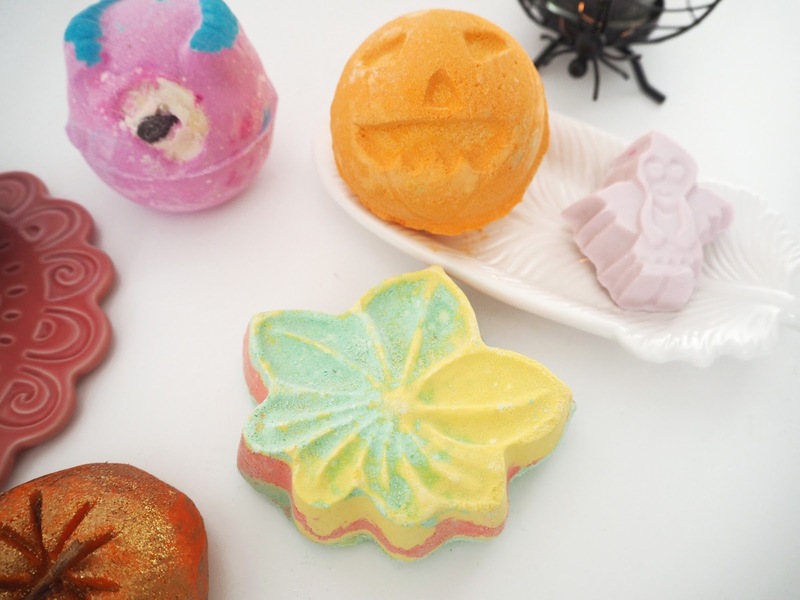 Have you tried any of the new Halloween launches from Lush yet? If so which are your favourites?